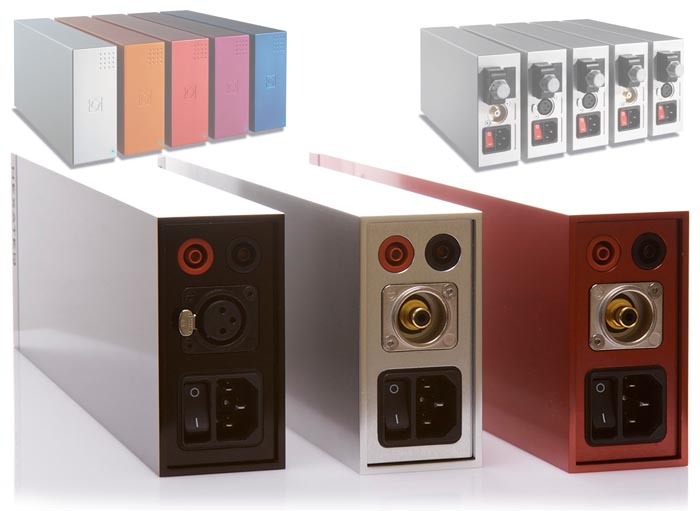 Studio 700 700W/4 ohm pricing TBA The Premium 1.0 power amps feature a linear power supply with a 10-cap parallel supply rail. Input buffer is the famous National LM4562 opamp. Add Shottky diodes. Input caps can be bridged with jumpers. High quality selected parts. As an upgrade we offer the SE version with discrete power regulators for the low voltage circuits and input buffer. 100 watts into 4 ohms, half into 8 ohms. 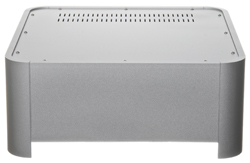 Flat, fully load-independent frequency response, low output impedance, very low frequency-independent THD. The unit can be used in 110 and 220V countries due to the dual primaries on the toroid after making the required adjustments. DC protection included. Balanced or single ended configuration available. A matching linestage for the Premium series is in the works. The sender was Richard Krol, general manager of Hexateq BVCA in Genk, Belgium. 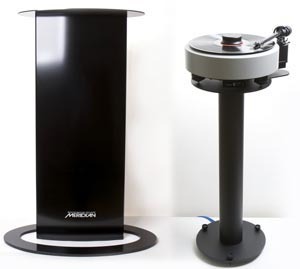 Checking their website photos, I couldn't fail to think on the $6.800/pr Kharma MP150 monos which Marja & Henk had reviewed in May of 2007 [the two small and faded photos were inserted below for comparison to the Hexateq Premium 1.0]. I replied to Mr. Krol's query in the affirmative but asked for the SE version to doll it up. He'd also do the optional input capacitor bypass for a best cap is no cap huzzah & hurray. Other companies I know of in affordable 2nd class on the Hypex train are Audio Zone, CIAudio and DIY Cables. At 4.500 Swiss Franks, Resolution Audio's two integrateds too run uCD but sit closer to 1st class [below]. There likely are far more embracers of Hypex tech. It's proven circuitry after all. 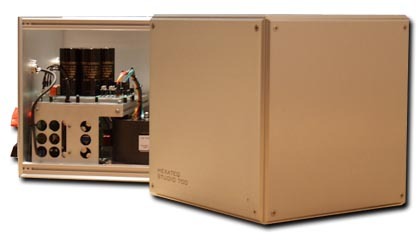 Unlike some class D solutions which aren't the stoutest into challenging low-frequency transients, Hypex plate amps are famous for their power and control into subwoofer applications. Perhaps that's because Putzeys' modulator includes the speaker terminals into its feedback loop to "remove the output filter from the closed loop response and eliminate speaker dependence that is all too common in class D amplifiers". That's how Jeffrey Kalt's website explains it. Clearly the Class D For High End bumper sticker on amps from Jeff Rowland & Bel Canto (ICEpower) and Kharma & Genesis (uCD) has signalled that this once lowly technology has arrived. 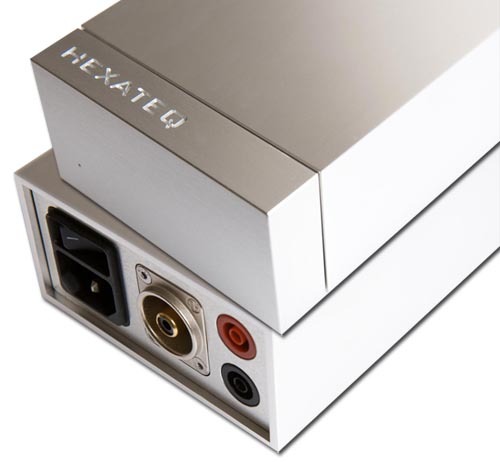 At the very least, Hexateq rides this ground swell as a proven repackager [at left their €220 enclosure to DIYers]. At best, the Belgians massaged the stock recipe a bit. Either way, I looked forward to hearing a Putzeys circuit mano i mano with ICEpower, conventional transistor amps, gain clones and tubes. Delivery of the Hexateqs got delayed because Hypex had recently overhauled their modules and Richard Krol was keen on getting the most current iteration reviewed.